Null hypothesis significance testing (NHST) is increasingly falling out of style with methodologically-minded behavioral and social scientists. Many diverse critiques have been leveled against significance testing; the debate is increasingly what should replace it. Building on work with my colleagues (see here and here), I discuss and critique one replacement option that has been persistently suggested over the years: confidence procedures. We begin with a parable. Nonplussed, Susan decided not to press the issue and asked for the bill. This scenario is obviously absurd. Mark seems to think that there is an obvious link between having a vehicle and having a place to store boxes. Indeed, some vehicles can store boxes, but not most. Mark’s proof that he has a vehicle missed Susan’s need for storage, and as such, was unhelpful. A X% confidence procedure (CP) is any procedure that generates intervals that contain the true value in X% of repeated samples. A confidence interval is a particular interval generated from a data using a confidence procedure. One way to think about a confidence procedure is like a net that catches a fish on a certain percentage of casts. The CP is a net that “catches” the true value of a parameter – a population mean, variance, rate, for example – X% of the time. Unlike with a net however, we cannot simply retrieve the net and look for the “fish”. We must use statistical theory to infer something about the true value of the parameter. Neyman developed the theory of CP within the frequentist theoretical framework, in which probability is not a quantification of uncertain knowledge, but rather a long-run average rate of occurrence of events. A procedure thus has a probability associated with it, but the CI, being a single realization from the procedure, does not. But what if we loosen the requirements of Neyman’s frequentist theory? Is there a sense in which the confidence coefficient from a confidence procedure quantifies our uncertainty about a parameter given a confidence interval? The answer here is again, no. To see why, we need to show a confidence procedure that is disconnected from knowledge about the parameter. Such examples have long been known in the theoretical statistical literature, and are not hard to find. My colleagues and I explore one such example in our paper, “The fallacy of placing confidence in confidence intervals” and its supplement. I will outline part of the example here. Suppose we are looking for a 10 meter long submarine in a vast ocean. We know that it has rested on the bottom of the ocean somewhere, and we also know that when it hits the ocean bottom, it releases two bubbles. These bubbles occur independently and with uniform probability anywhere along the length of the submarine. Our goal is to find the submarine’s hatch, which is halfway along the submarine’s length. We represent the hatch location as (mu) because it is the submarine’s mean (and median) location. We would like to use the bubbles to compute a confidence interval that is supposed to quantify our knowledge about (mu). One possible confidence interval is the interval between the bubbles. This is easily seen to be a 50% confidence interval, because the hatch is the median; given that the first bubble is on one side of the hatch, there is a 50% probability that the second bubble ends up on the other side of the hatch. The two bubbles are on opposite sides of the hatch 50% of the time. This confidence procedure is generally applicable as a nonparametric confidence procedure for the median, given two observations. Another well-known confidence procedure that is uses the interval between two observations is the Student’s (t_1) interval. We outline the properties of this procedure in the submarine case in our supplement; for now, all that is important is the knowledge that the interval between the bubbles forms a 50% CI. The question is now, does the confidence coefficient of 50% quantify our uncertainty about whether the hatch is in the interval? The answer is definitely “no.” To see why, we need only look at how the bubbles might occur. In panel A, the bubbles are almost 10 meters apart. In this case, the 50% confidence interval is very wide. But our knowledge of the parameter is very precise, because if the submarine is 10 meters wide, then bubbles that are 10 meters apart must come from opposite ends of the craft. 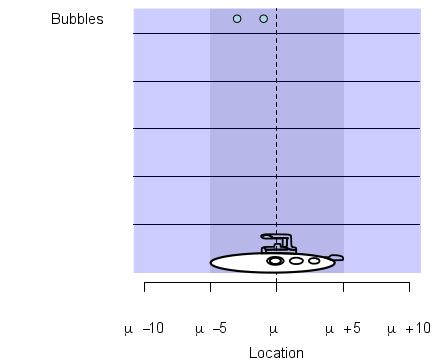 The mean (mu) must be very close to the middle of the bubbles (the “likelihood” row shows the possible locations of the hatch, given the bubbles). Further, because the bubbles are more than 5 meters apart, the 50% confidence interval must contain the hatch, with 100% certainty. The 50% confidence coefficient is unrelated to our actual certainty that the parameter is in the interval. In panel B, the bubbles are very close together. The two bubbles are so close that they do not provide much more information than a single bubble would. The possible locations of the hatch, indicated by the “likelihood” row, much wider than before. In spite of the narrow CI, knowledge about the location of the hatch is as diffuse as it can be. Only 5% of confidence intervals as narrow as this one contain the true value. Far from being 50% certain that the true value is in the interval, we should be fairly certain it is not. An alternative approach to the submarine problem is to take the middle 50% of the possible values. This forms an objective Bayesian 50% credible interval, and also, incidentally, a 50% confidence interval. Unlike the first confidence procedure, the Bayesian procedure allows for reasonable inferences because it is derived from the likelihood. See the paper and the supplement for more details 1. We can now we see why a focus on confidence procedures is misguided. The fact that a procedure is a confidence procedure is unrelated to its usefulness in making good inferences about a parameter of interest. Papers that present novel confidence procedures – there are plenty of them – focus on the wrong thing. A proof that a procedure has a long-run probability of including the mean of X% is like Mark proving that he had a vehicle. Vehicle-ness was irrelevant to Susan. What Susan wanted was a place to store her boxes. 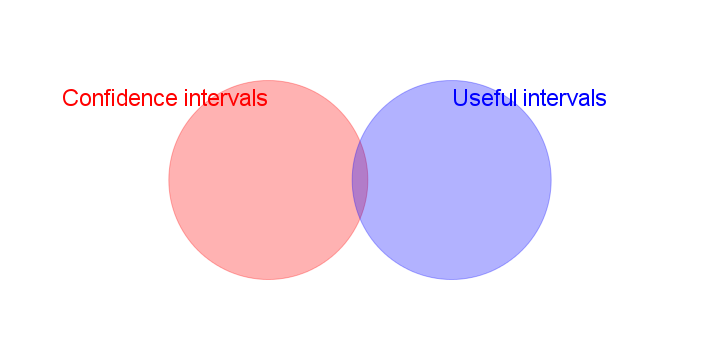 What researchers want are intervals that allow good inferences. But in order to prove that a procedure makes useful inferences, you need a different theoretical framework than confidence procedures. A good start would be the likelihood or Bayesian frameworks. Just as some vehicles may be useful to store boxes, some confidence procedures are also Bayesian credible procedures. Proponents of particular confidence procedures have a responsibility to researchers to prove that their procedures also allow reasonable inferences, which will require further work than simply proving that a procedure is a confidence procedure. Confidence interval proponents believe, incorrectly, that the confidence framework can be relied upon, by itself, to generate useful inferences. Reasonable inferences were never the purpose of confidence procedures, so it is not surprising that they fail dramatically in many simple cases. 1 It is important to note that the Bayesian-derived confidence procedure, in spite of its obvious reasonableness and its lack of the inferential pathologies of other confidence procedures, is not the preferred frequentist interval. There are a number of confidence procedures that are preferred under frequentist theory in the submarine example because on average, they exclude incorrect values at a higher average rate; see the supplement and Welch, 1939.